After finding this Framecraft ceramic mauve bowl with gilded metal lid (on sale), I went into my jewelry stash (from flea markets) & found the rose from a necklace that I could sew onto the lid for a handle. Then, I created a simple design for the lid from my stash. It is a smaller variation of the Pavillion Steps from The Needlepoint Book by Jo Ippolito Christensen. And, the 3 colors I used (mauve, pink, & gold) are placed differently than in the diagram but as Jo wrote, 3 colors are essential to obtain a 3-dimensional effect. 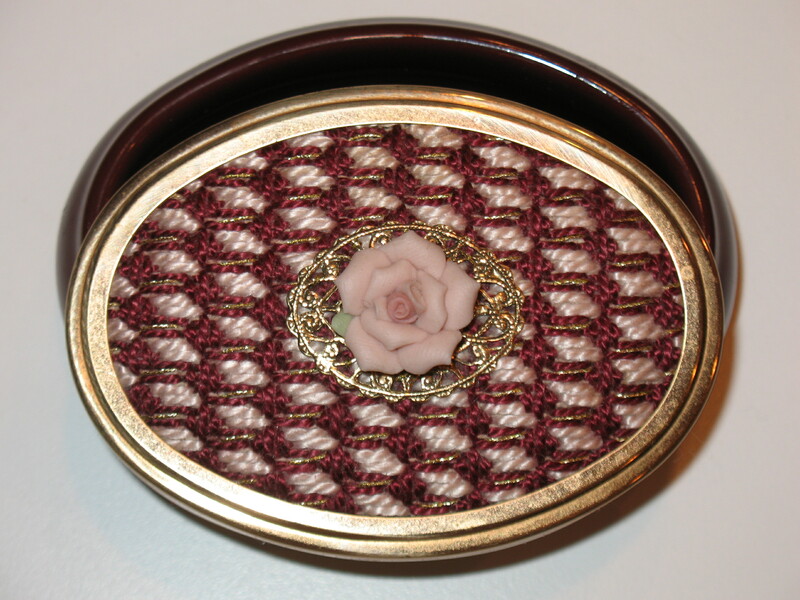 The little bit of gold Kreinik (#4 very fine) used in the pattern complimented the rose handle & the metal lid without overpowering the small lid. It now holds some small miscellaneous needlepoint aides & an eraser which gets a lot of use!